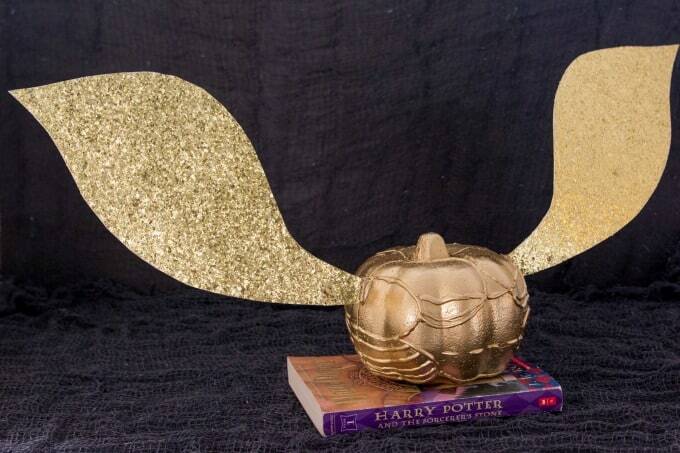 If you’re a fan of Harry Potter AND love decorating pumpkins, why not combine the best of both worlds with an awesome Golden Snitch pumpkin for Halloween! This post contains affiliate links to help you find everything you need to make this craft. We LOVE Harry Potter! It all started when I took the Harry Potter Studios tour in London. I was hooked, then came home and got my 10 year old hooked too. 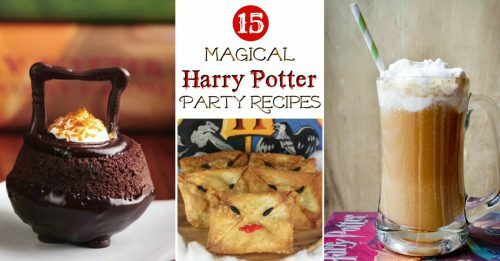 Since then we’ve visited The Wizarding World Of Harry Potter (a MUST-SEE for HP fans) and we’re planning a Harry Potter birthday party for November! 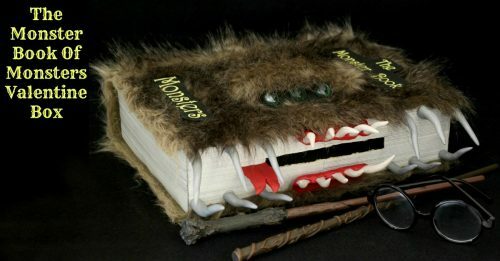 We even made a Monster Book Of Monsters box for Valentine’s Day! We’re not done yet! 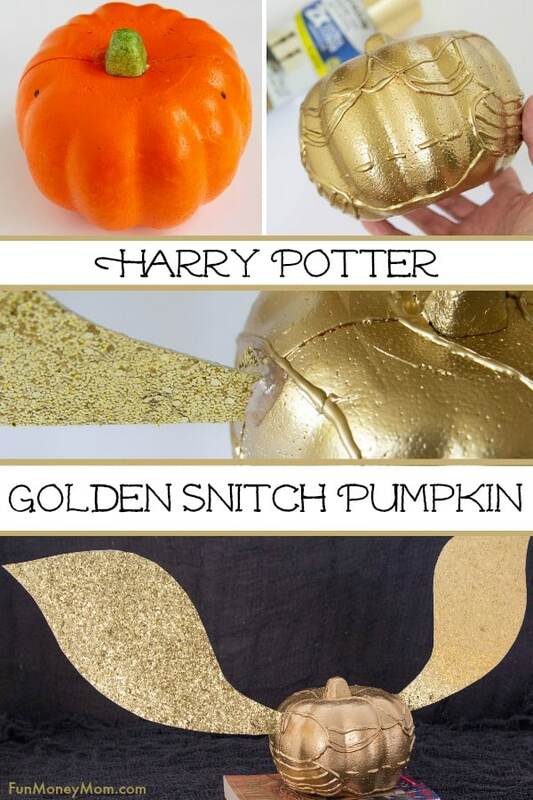 When I stocked up on styrofoam pumpkins the other day, a Harry Potter Golden Snitch pumpkin was one of the first things that came to mind. 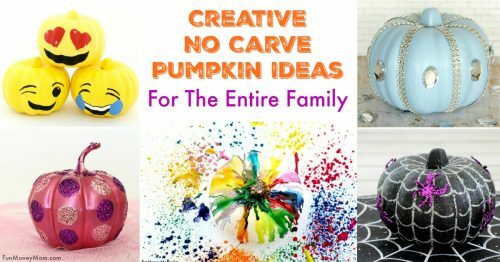 It’s the perfect craft for older kids (younger ones might not be ready for spray paint or a glue gun). Honestly, it’s pretty fun for grownups too…I had a blast making it! Ready to get started? 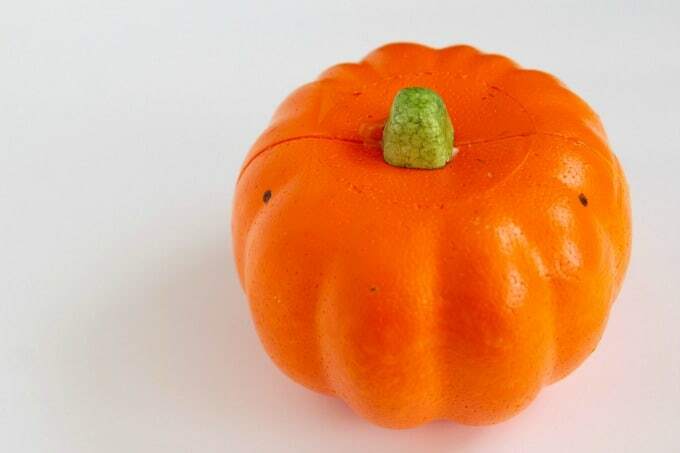 I love these orange styrofoam pumpkins from Dollar Tree. Since they’re only a dollar, I can experiment and not feel bad if I totally screw it up. 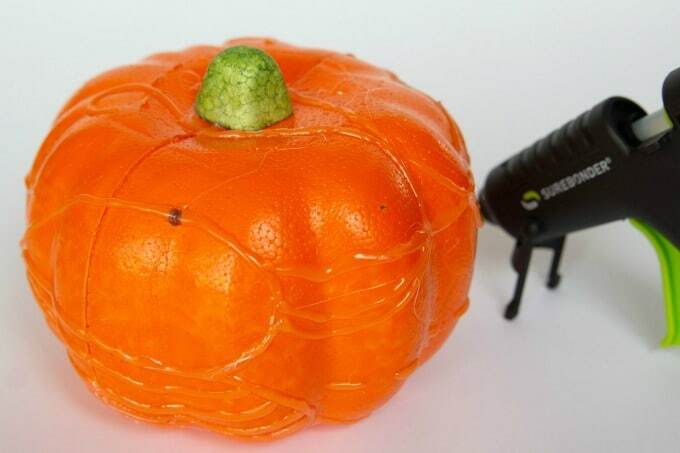 It hurts a lot less to throw away a pumpkin that costs $1 than one that costs $10! I started by making two black dots to mark there the wings would go. This would help me keep the hot glue symmetrical. 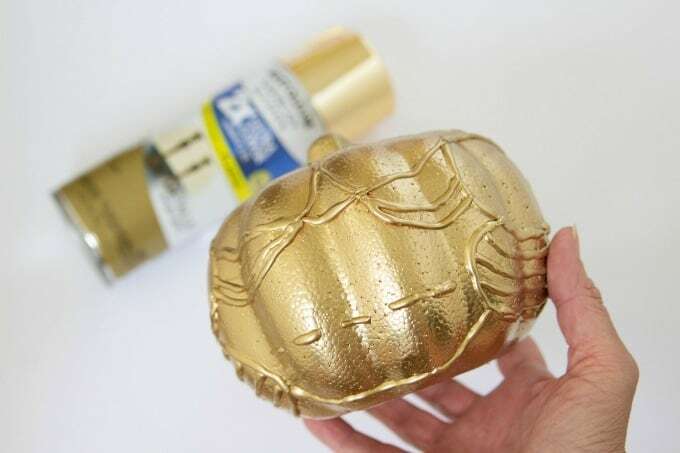 Next I used gold spraypaint to paint the pumpkin (you definitely want to go outside for this part). 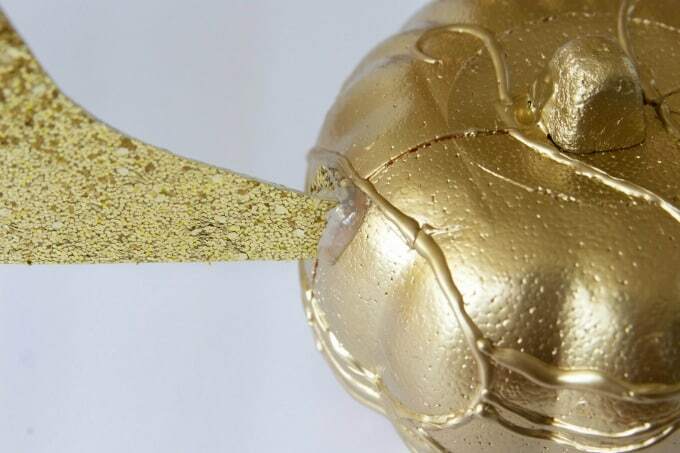 It was already starting to look like the Golden Snitch! Once the spraypaint was dry, it was time for the wings. 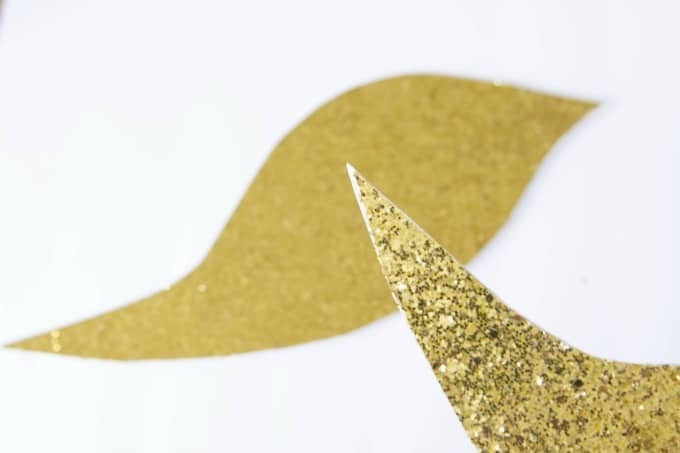 I’d found glittery gold cardstock at the craft store and grabbed a couple sheets. 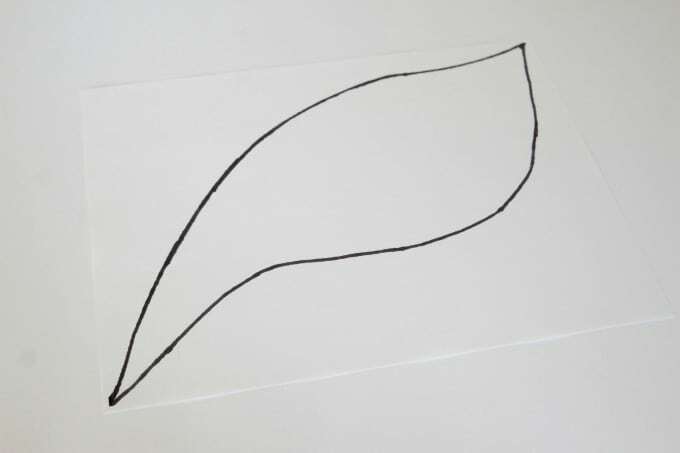 I experimented on paper first and after a couple tries, and some Google images for inspiration, I came up with a shape that I liked. I cut it out and used it as a tracer. If you want to trace the one I made, you can print it here. Trace the pattern onto the back of the cardstock. IMPORTANT: Be sure to trace two wings using one side of the tracer, then flip the tracer and draw two more wings using the other side. Otherwise the wings won’t match up when you try to glue them back to back. 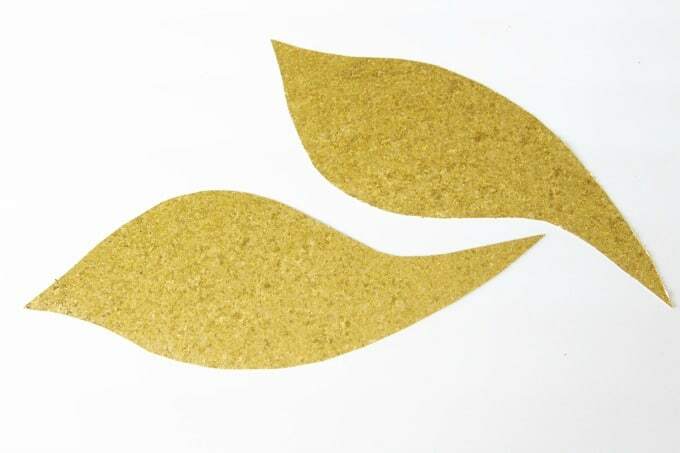 Trace two wings on each piece of cardstock. Be sure to draw them both out first before you cut. I had to do a little rearranging to make both wings fit. 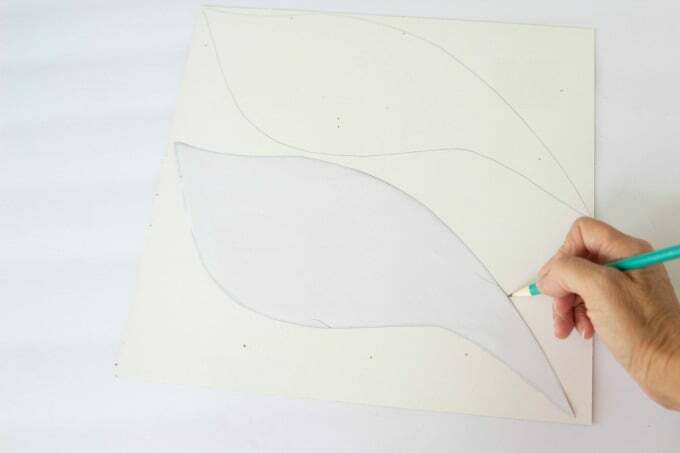 Once you’ve traced the wings, go ahead and cut them out. 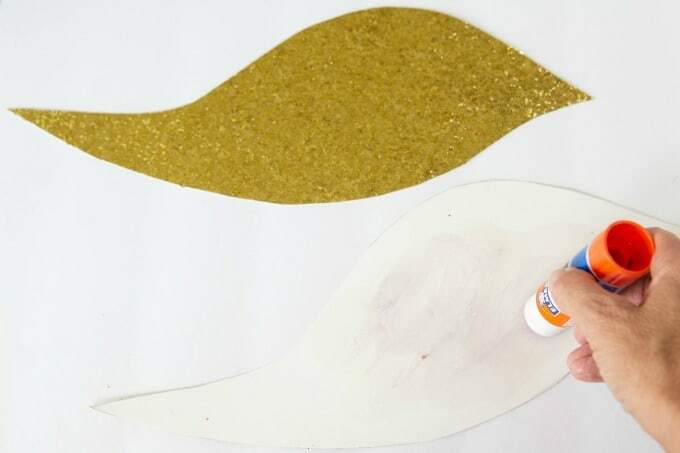 Glue the sets of wings back to back so that they’re glittery on both sides. 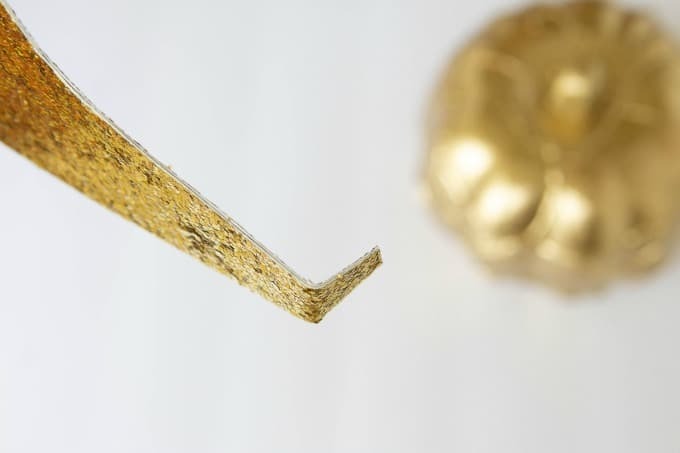 You can use your glue gun or just regular glue for this part. If the two wings don’t match up exactly, just take your scissors and give them a little trim. To glue the wings to the pumpkin, I cut off the pointy tip and bent the card stock at the end. Then I used LOTS of hot glue. If I make this again, I’d use sparkly craft foam instead. The cardstock worked fine but it was heavy and needed a LOT of hot glue. 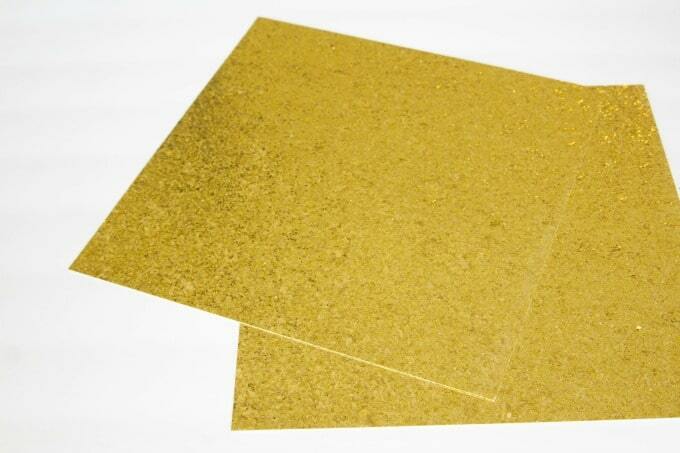 The craft foam would be lighter and may not need so much. I sprayed a little extra gold spraypaint in a cup and painted over the glue. Be sure it’s a cup that you’re okay with throwing away…spraypaint is hard to clean and it’s easier to just use something disposable. 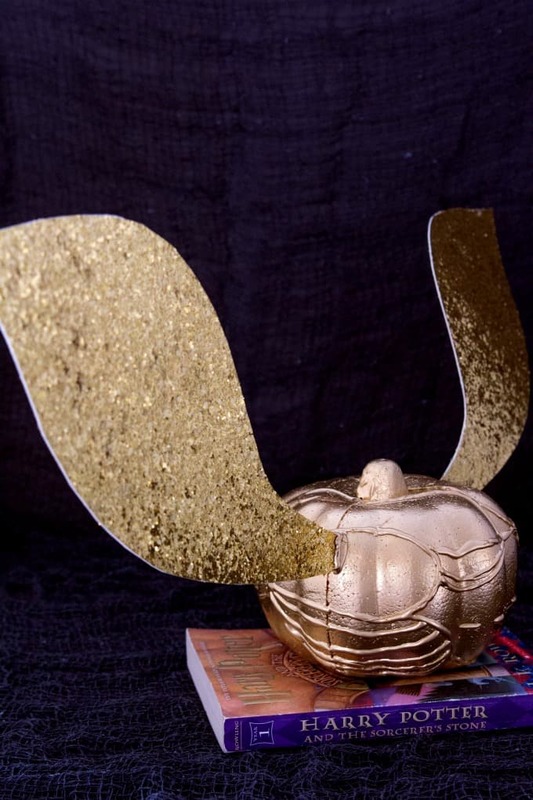 That’s it…your golden snitch pumpkin is finished! I love how it turned out and when my girls walked in and saw it, I got tons of oohs and aahs! 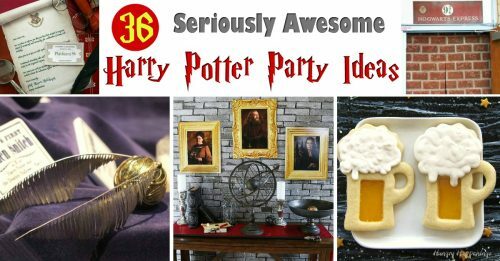 This is the perfect Halloween craft for Harry Potter fans! 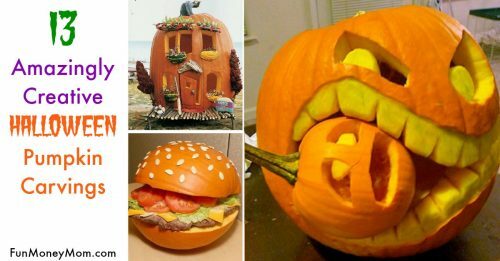 What kind of Halloween pumpkins are you making this year? 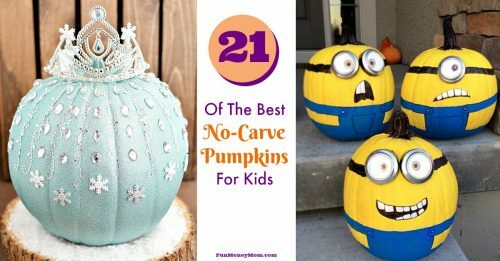 Prefer to carve pumpkins instead?